Linear discriminant analysis (commonly abbreviated to LDA, and not to be confused with the other LDA) is a very common dimensionality reduction technique for classification problems. However, that’s something of an understatement: it does so much more than “just” dimensionality reduction. In plain English, if you have high-dimensional data (i.e. a large number of features) from which you wish to classify observations, LDA will help you transform your data so as to make the classes as distinct as possible. More rigorously, LDA will find the linear projection of your data into a lower-dimensional subspace that optimizes some measure of class separation. The dimension of this subspace is necessarily strictly less than the number of classes. This separation-maximizing property of LDA makes it so good at its job that it’s sometimes considered a classification algorithm in and of itself, which leads to some confusion. Linear discriminant analysis is a form of dimensionality reduction, but with a few extra assumptions, it can be turned into a classifier. (Avoiding these assumptions gives its relative, quadratic discriminant analysis, but more on that later). Somewhat confusingly, some authors call the dimensionality reduction technique “discriminant analysis”, and only prepend the “linear” once we begin classifying. I actually like this naming convention more (it tracks the mathematical assumptions a bit better, I think), but most people nowadays call the entire technique “LDA”, so that’s what I’ll call it. LDA as an algorithm: what does it do, and how does it do it? This is a lot for one post, but my hope is that there’s something in here for everyone. Before we dive into LDA, it’s good to get an intuitive grasp of what LDA tries to accomplish. This could mean that the number of features is greater than the number of observations, or it could mean that you suspect there are noisy features that contain little information, or anything in between. Preserve (or even increase!) the “distinguishability” of your classes or the “separatedness” of the classes in your feature space. This is the problem that LDA attempts to solve. It should be fairly obvious why this problem might be worth solving. To judiciously appropriate a term from signal processing, we are interested in increasing the signal-to-noise ratio of our data, by both extracting or synthesizing features that are useful in classifying our data (amplifying our signal), and throwing out the features that are not as useful (attenuating our noise). LD1 and LD2 are among the projections that LDA would consider. In reality, LDA would consider all possible projections, not just those along the x and y axes. LD1 is the one that LDA would actually come up with: this projection gives the best “separation” of the two classes. UPDATE: For another illustration, Rahul Sangole made a simple but great interactive visualization of LDA here using Shiny. Diagonalize to get its eigenvalues and eigenvectors. Pick the largest eigenvalues, and their associated eigenvectors. We will project our observations onto the subspace spanned by these vectors. Concretely, what this means is that we form the matrix , whose columns are the eigenvectors chosen above. will allow us to transform our observations into the new subspace via the equation , where is our transformed observation, and is our original observation. For a more detailed and intuitive explanation of the LDA “recipe”, see Sebastian Raschka’s blog post on LDA. where I denote the within and between-class scatter matrices of the projection vector by and , to avoid confusion with the corresponding matrices for the projected vector . where and are the between-class scatter matrices, and and are the within-class scatter matrices, for and its projection , respectively. It’s now a simple matter to write in terms of , and maximize . Without going into the details, we set (whatever that means), and use the fact that the trace of a matrix is the sum of its eigenvalues. I don’t want to go into the weeds with this here, but if you really want to see the algebra, Fukunaga is a great resource. The end result, however, is the same condition on the eigenvalues and eigenvectors as stated above: in other words, the optimization gives us LDA as presented. There’s one more quirk of LDA that’s very much worth knowing. Suppose you have 10 classes, and you run LDA. It turns out that the maximum number of features LDA can give you is one less than the number of class, so in this case, 9! Proposition: has at most non-zero eigenvalues, which implies that LDA is must reduce the dimension to at least . To prove this, we first need a lemma. Lemma: Suppose is a set of linearly dependent vectors, and let be coefficients. Then, , a linear combination of outer products of the vectors with themselves, is rank deficient. Proof: The row space of is generated by the set of vectors . However, because this set of vectors is linearly dependent, it must span a vector space of dimension strictly less than , or in other words less than or equal to . But the dimension of the row space is precisely the rank of the matrix . Thus, , as desired. With the lemma, we’re now ready to prove our proposition. OK so we’re done with the math, but how is LDA actually used in practice? One of the easiest ways is to look at how LDA is actually implemented in the real world. scikit-learn has a very well-documented implementation of LDA: I find that reading the docs is a great way to learn stuff. Below are a few miscellaneous comments on practical considerations when using LDA. scikit-learn’s implementation of LDA has an interesting optional parameter: shrinkage. What’s that about? 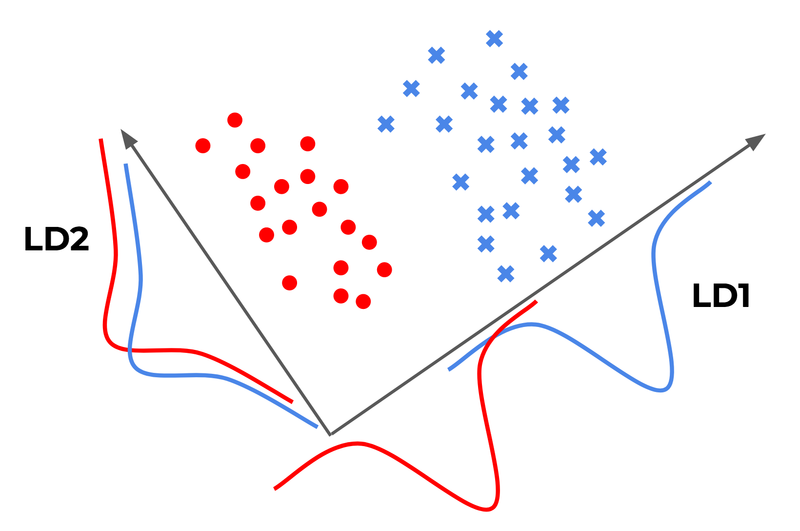 Here’s a wonderful Cross Validated post on how LDA can introduce overfitting. In essence, matrix inversion is an extremely sensitive operation (in that small changes in the matrix may lead to large changes in its inverse, so that even a tiny bit of noise will be amplified upon inverting the matrix), and so unless the estimate of the within-class scatter matrix is very good, its inversion is likely to introduce overfitting. One way to combat that is through regularizing LDA. It basically replaces with , where is the identity matrix, and is the regularization parameter, or the shrinkage constant. That’s what scikit’s shrinkage parameter is: it’s . If you’re interested in why this linear combination of the within-class scatter and the identity give such a well-conditioned estimate of , check out the original paper by Ledoit and Wolf. Their original motivation was in financial portfolio optimization, so they’ve also authored several other papers (here and here) that go into the more financial details. That needn’t concern us though: covariance matrices are literally everywhere. For an illustration of this, amoeba’s post on Cross Validated gives a good example of LDA overfitting, and how regularization can help combat that. Now, how LDA acts as a classifier is a bit complicated: the problem is solved fairly easily if there are only two classes. In this case, the optimal Bayesian solution is to classify the observation depending on whether the log of the likelihood ratio is less than or greater than some threshold. This turns out to be a simple dot product: , where . Wikipedia has a good derivation of this. There isn’t really a nice dot-product solution for the multiclass case. So, what’s commonly done is to take a “one-against-the-rest” approach, in which there are binary classifiers, one for each of the classes. Another common technique is to take a pairwise approach, in which there are classifiers, one for each pair of classes. In either case, the outputs of all the classifiers are combined in some way to give the final classification. LDA is similar to a lot of other techniques, and the fact that they all go by acronyms doesn’t do anyone a favor. My goal here isn’t to introduce or explain these various techniques, but rather point out their differences. LDA is very similar to PCA: in fact, the question posted in the Cross Validated post above was actually about whether or not it would make sense to perform PCA followed by LDA. There is a crucial difference between the two techniques, though. PCA tries to find the axes with maximum variance for the whole data set, whereas LDA tries to find the axes for best class separability. Going back to the illustration from before (reproduced on the right), it’s not hard to see that PCA would give us LD1, whereas LDA would give us LD2. This makes the main difference between PCA and LDA painfully obvious: just because a feature has a high variance, doesn’t mean that it’s predictive of the classes! QDA is a generalization of LDA as a classifer. As mentioned above, LDA must assume that the class contidtional distributions are Gaussian with the same covariance matrix, if we want it to do any classification for us. QDA doesn’t make this homoskedasticity assumption (assumption number 2 above), and attempts to estimate the covariance of all classes. While this might seem like a more robust algorithm (fewer assumptions! Occam’s razor! ), this means there is a much larger number of parameters to estimate. In fact, the number of parameters grows quadratically with the number of classes! So unless you can guarantee that your covariance estimates are reliable, you might not want to use QDA. After all of this, there might be some confusion about the relationship between LDA, QDA, what’s for dimensionality reduction, what’s for classification, etc. This CrossValidated post and everything that it links to, might help clear things up. LDA is closely related to analysis of variance (ANOVA) and regression analysis, which also attempt to express one dependent variable as a linear combination of other features or measurements. However, ANOVA uses categorical independent variables and a continuous dependent variable, whereas discriminant analysis has continuous independent variables and a categorical dependent variable (i.e. the class label).